Rocket science is stuck in a rut and it's all Hitler's fault. 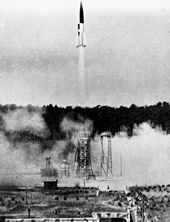 If he had invested Germany's waning resources into Messerschmitts instead of V-2s we probably wouldn't have had ballistic missiles, or a space program, and we'd now be using cool alternatives like space slingshots. This is the interesting argument put forth by Neal Stephenson in an excellent article at Slate. Stephenson reviews the history of rocket development and finds that the 8 trillion dollars spent by the USA and USSR created a process for putting things into space that's impossible to get away from. There is no shortage of proposals for radically innovative space launch schemes that, if they worked, would... bring the cost and risk of space launch down to the point where fundamentally new things could begin happening in outer space. But we are not making any serious effort as a society to cross those valleys... regulation is only one culprit; at least equal blame may be placed on engineering and management culture, insurance, Congress, and even accounting practices. In making his point about rockets Stephenson is making a larger point that's especially relevant for inventors. Many inventions must find ways to succeed within the straight-jackets of existing infrastructures, traditions and mindsets. When the Segway scooter was first introduced the hype was so overblown that there was actually talk that cities would be redesigned around it. That was NOT going to happen. As brilliant as the I-phone is, it could not exist without the wireless infrastructure already in place to support it.